The office Day Book entry for 9 June 1800 has 'W R Cartwright Esqre / View of the Anti Room / ½ day Gandy'. 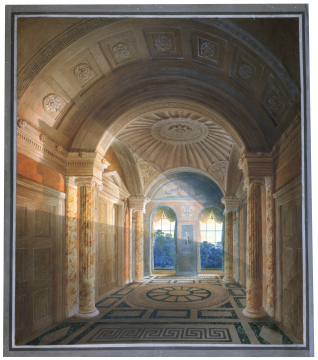 It would be remarkable if Gandy made the drawing in half a day and, in fact, the first entry for Gandy working on a 'Perspective View of / the Anti Room' appears on 19 May 1800 and is followed by 13 similar entries finishing on 9 June 1800, that is fourteen and half days work. The 'Anti Room' between the library and the eating room appears in all of the plans for the ground floor. In drawing  it is rectangular with an oval ceiling and two south-facing windows and is linked to a separate, one-bay entrance on the right-hand side. Drawings , [35,  and  have the anti-room reconfigured so that it is L-shaped. Thus it is two bays wide at the back but three bays wide at the front and provides an integral entrance to the south-west side of the house. Drawings  and  have the entrance bay labelled 'Vestibule'. Although the entrance is unassuming, the anti-room as shown in Gandy's perspective is rather grand with a fluted Ionic order supporting a ribbed domical ceiling and with a Greek fret designs for both ceiling and floor.